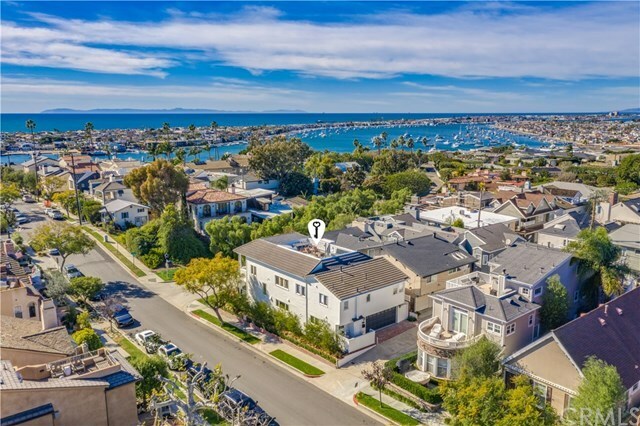 Peaceful seaside living awaits at this remarkable Corona del Mar residence, situated on a corner lot and featuring impressive views of Balboa Bay, the Pacific Ocean, and Catalina Island. Every detail throughout has been carefully considered and hand-selected, from the placement of trees to the wide, long plank wood floors, custom paneling, woodwork, and built-ins. Upon entry, a feeling of tranquility emanates from every square inch of the home. Crisp white walls, a zen color palette, and open living areas serve as the perfect canvas for practical, effortless everyday living. The kitchen features an abundance of custom cabinetry and counter space, a combination of recessed and pendant lighting, and an island with double-sided bar seating. The master suite offers stunning ocean views from the private balcony and an en suite spa-style bathroom with dual sinks and vanities, soaking tub, and separate shower. Offering a combined 953 sq. ft., the outdoor spaces include an elevated front deck featuring a fire pit, covered patio with a water fountain, the aforementioned master suite balcony, and a 495 sq. ft roof-top deck featuring panoramic 360-degree views. Rounding out the amenities, this elegant residence offers a huge pantry, full-service laundry room with laundry chute and pressure washing sink faucet, central A/C throughout, and fireplaces in the living room and master bedroom. Just a short walk yields access to all of Corona del Marâs beaches, shopping, and exquisite dining.